In recent years, there has been an increase in concern and discussion around children’s health and development. A 2017 UK study on physical activity in primary school age children determined that only 21% of boys and 16% of girls are meeting the current daily recommendation of 60 minutes. An Australian study conducted this year also found that 66% of children aged between 2-5 years old are not getting the 3 hours of daily exercise recommended for their growth and development. Reasons behind this lack of activity are considered to include too much screen time, not enough support or encouragement from parents, and injury or other physical barriers. Back pain in particular is a common complaint amongst school age children. So how can we ensure that our kids get enough exercise while minimising the risk of injury? School backpacks have long been identified as a leading cause of back pain in children, with some kids routinely carrying bags weighing up to 30% or more of their own body weight. Heavy backpacks can result in fatigue, muscle strain, and upper back and neck pain, as well as placing stress on the spine. Backpacks can also cause ongoing health issues including chronic pain, inflammation and nerve damage. To prevent your child developing back pain as a result of their school bag, ensure that the load does not exceed 10% of their body weight. 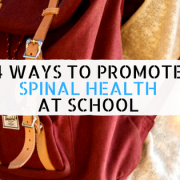 You can also encourage your kids to leave items at school, clean out their backpack regularly, and check if they are experiencing any pain or aching muscles. Choosing the right backpack is essential – the bag should fit your child’s torso correctly, include supportive features like adjustable shoulder and chest straps, and have multiple compartments for the even distribution of weight. Another way to minimise the chance of injury is the development of healthy backpack habits, such as wearing both shoulder straps and loading the bag on a desk rather than on the floor. Another common cause of injuries amongst school age children is sport. Many Aussie kids play sport both at school as part of P.E, as well as after school and on the weekends. Although this is beneficial for their overall health, parents should be careful of allowing their children to train excessively. Overtraining as well as using improper techniques can result in fatigue and the increased likelihood of a serious overuse injury, as well as chronic back pain. Experts suggest that cross-training can help prevent injury, where children play a range of sports and avoid concentrating on one particular sport and its accompanying repetitive motions. Other tips include giving your child a 3-4 month break every year from their chosen sport, ensuring that they have 2 days off a week to allow for recovery and muscle repair, and following the rule of age vs hours. This means that kids should only participate in organised sport for as many hours a week as their current age eg: an 8 year old should not be playing more than 8 hours of sport a week. One of the less obvious causes of back pain is stress, where the combination of tension in the neck and upper back, along with long periods of sitting in a sedentary position, can lead to ongoing spinal issues. A 2018 study reveals that young people in Australia experience high levels of stress in school, with 47% of students reported as feeling very tense when they study compared to the international average of 56%. A further 50% of students from Years 7-12 reported feeling moderately to extremely stressed over exams, with the majority of pressure to perform well academically coming from themselves. Parents can help their children develop healthy methods of coping with stress, including a regular exercise schedule and taking up yoga practice. Yoga has been proven to help develop mindfulness, resilience, self-esteem and increase psychological well-being overall, including reducing stress. Yoga is also beneficial for physical health, able to enhance your child’s flexibility, lower their blood pressure, increase their muscle strength and improve their posture. Finally, one of the best ways to ensure that your child can remain healthy and reduce the risk of back pain is to ensure they are maintaining good posture. As both children and adults are sitting for longer periods of time, there is growing importance on having proper sitting and standing posture. Poor posture can be improved with supportive school shoes that reduce pressure on the spine, regular stretching and movement during the school day, and the use of ergonomic furniture for study. At moll Shop Australia, we understand how crucial ergonomic furniture is to the healthy development of your child. This is why all our kids study chairs and study desks are height-adjustable, with the flexibility to grow with your child, and is also the reason behind our constant devotion to innovation and the development of quality designs. Keeping our kids moving is of vital importance in our increasingly sedentary school and work environments. Following the above tips is an easy way to ensure that your child can stay active and healthy while minimising the risk of injury and back pain. To learn more about ergonomics and to browse our full product range, please visit our Australian online store. Nobody wants to get injured at work. 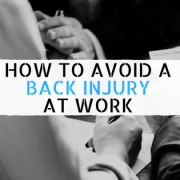 But for office workers and other professionals, a back injury is one of the most common injuries that you can experience during your working life. In 2017, Safe Work Australia reported that ‘body stressing’, which includes muscle strains and spinal injuries, was the most common cause of workplace compensation claims from 2015-2016. 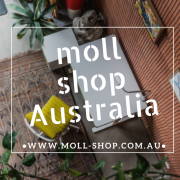 At moll Shop Australia, we focus on developing and refining our range of ergonomic office furniture with the aim of reducing the likelihood of back strain or injury at work. A reliable and quality study desk and office chair is tailored to your measurements and allows your spine the natural movement and flexibility that it needs. But how else can we avoid suffering a workplace related spinal or muscular injury? One simple way to avoid a back injury at work is to ensure that you have good posture, no matter whether you work standing or sitting. People who work on computers tend to slouch forward, rounding their shoulders and letting their head hang forward, unknowingly holding this position for hours. People who stand at work can have similar issues by frequently twisting, bending and reaching for things at their workstation. These types of poor posture habits leave the back unsupported, and can result in chronic back pain and other injuries. The most important thing to remember is to avoid getting trapped in a static position. Standing workers need to keep moving to keep the body limber, and seated workers similarly need to stretch and take regular breaks to prevent stiffness and muscle strain. Having an ergonomically correct workstation is also important! 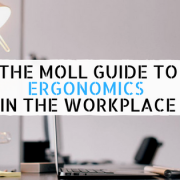 Check out our blog post The Moll Guide to Ergonomics in the Workplace to learn more. Regular stretching is another way to avoid back injury in the workplace. Stretching your wrists, shoulders, back, torso, neck, hip flexors and legs can help to reduce workplace injury, and some can even be done while sitting at your desk. This list of stretches will help keep you moving during your work day. Make sure that the stretches are slow and sustained, holding each for between 10 and 20 seconds each. A regular practice of yoga, tai chi, pilates and other low-impact exercise can also help prevent back injuries. Yoga in particular has been proven to increase flexibility, build muscle strength, and improve your posture, balance and your ability to focus, along with a range of other benefits. Prevention is always better than a cure, as the old saying goes, and one of the easiest ways to avoid a back injury at work is to exercise regularly and strengthen the muscles in your back. Regular low-impact aerobic exercise such as swimming or walking can strengthen your back without exposing it to any stress or sudden jolts. Exercise also assists in maintaining a healthy weight, as excess weight can put strain on your lower back and be another cause of chronic pain. Exercise helps to condition your back muscles, so that they can better support the spine. This leads to relief in any back and neck pain you might be experiencing, and better alignment of the spine overall. Check out this list of back strengthening exercises to get started. The final way that you can avoid a back injury at work is to reduce your stress levels. Stress causes tension in the spine, and prolonged tension can lead to pain and other injuries. Of course it is impossible to remove stress completely from the workplace, and studies have shown that stress actually has benefits, able to increase your motivation, focus and resilience levels. However, too much stress can impact your physical and mental health, and needs to be effectively managed. Some useful stress management techniques include yoga, meditation, breathing exercises and taking frequent short breaks from stressful tasks. Getting out of the office for a walk during lunch, keeping organised and on top of your workload, and listening to music are also helpful and productive ways to deal with stress. If you are unsure of where to start with meditation, there are several websites and apps that can help, such as Headspace. Therefore, avoiding becoming a statistic with a workplace related back injury is easy, if you make sure that you are maintaining the correct posture at your workstation, stretching and exercising regularly, and applying the stress management techniques that work for you. With a few simple changes, you can ensure that your back stays healthy throughout your working life! To learn more about ergonomics and browse our full product range of ergonomic office furniture, please visit our Australian online store. At moll Shop Australia, we are dedicated to the design and development of innovative, reliable and ergonomic office furniture. But why is having an ergonomic workplace so important? A recent article stated that the average office worker spends over 65% of their time at work in a sedentary seated position, which can lead to a range of health problems including spinal issues. Back injuries can also occur through repetitive motions, poor posture, fatigue and workplace accidents. Ergonomics can help prevent these injuries, as well as benefit our health, productivity and happiness in the office. One of the most important pieces of office furniture is your desk chair. In the office, we sit in these chairs for up to eight hours a day, so it makes sense that they should be able to be adjusted to suit our bodies. Things to consider when choosing an office chair include height, seat depth, lumbar support, arm rests, comfort and mobility. Swivel chairs are the best type of desk chairs as they do not restrict our movement and force us to bend in unnatural ways. Your desk chair should be able to be adjusted in terms of seat height and depth to suit your proportions. Your feet should be able to rest fully on the floor, and the back of the chair should have a natural curve to accommodate the spine. Ensuring that your chair has been adjusted to suit your needs will prevent back pain and other injuries during your time at work. Click here to see our range of ergonomic height-adjustable office chairs. The other most important piece of office furniture in your workplace is your desk. A desk that is too high, low or cramped can all cause muscle strain and spinal issues. The general rule is that you should have enough space beneath the desk to cross your legs, while the angle between your elbow and forearm should be 90 – 120 degrees. Your desk should also be organised into zones, with office supplies and documents that you use often, sometimes and rarely at corresponding distances. This ensures that you are not constantly reaching for what you need and possibly causing a repetitive injury. Your monitor should likewise be positioned at a comfortable distance so that you are not straining your neck to see it. An increasingly popular trend in the workplace are standing desks or height-adjustable desks, where you can stand or sit at the desk and continuously change your posture. The moll range of height-adjustable office desks are electronically controlled, while others are unfolded or wound up. Some people have switched to standing-only desks, but experts have stressed that standing desks do not equal exercise, and are not necessarily healthier. Switching between standing and sitting is considered the best method, giving you time to stretch and maintain flexibility without getting too fatigued. You can find our range of award-winning ergonomic office desks here. An often overlooked piece of office furniture is storage. Storage containers, filing cabinets and shelves are all regularly used in the workplace, and their role in promoting an ergonomic workplace is often crucial. Having to continuously turn, bend or move to reach storage can cause strain and possible injury, particularly if it becomes a repetitive movement that you perform every day. The solution to this is mobile storage containers, which can be easily rolled to the most convenient position for your daily use. Roll containers do not have to be picked up and are also compact enough to store under your desk or in corners away from high-traffic areas in the workplace. To browse our mobile storage options, click here. Another essential piece of the office ergonomics puzzle is desk lighting. 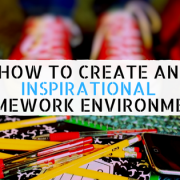 As we discussed in the previous month’s blog post, How To Create An Inspirational Homework Environment, natural light is the ideal light for work, as it reinforces a healthy sleep-wake cycle and benefits performance, productivity and positivity in the office. However, if your workplace does not have access to natural light, the next best option is investing in desk lighting which mimics natural light. Having a well-lit workspace also reduces the chances of eye strain and fatigue. Click here to see our range of desk lighting options. Finally, there are several healthy habits which you can adopt as part of achieving an ergonomic workplace. Eating small healthy meals throughout the day will prevent you from making unhealthy food choices, while limiting your caffeine intake and drinking more water will prevent the dreaded 3pm slump. Making time to get outside during your lunch break will ensure you get a dose of Vitamin D, while being hygienic will lessen the chances of becoming ill.
Apart from changing your sitting position, you should also take regular breaks to refresh your body and mind. You can even do stretching exercises while you work, to prevent sore stiff muscles and increase blood flow. 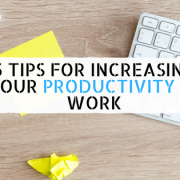 With the correct office furniture and a few healthy changes to your day, it’s easy to make your work a more ergonomic, healthier and productive place. To learn more about the benefits of ergonomic furniture, and to browse our full product range, please visit our Australian online store. moll is a leading German furniture manufacturer, founded in 1925 as a family business in Baden – Württemberg in Germany. Our company manufactures office and organisational furniture, including desks and swivel chairs, and is an international leader in the design of children’s desks and chairs. This ergonomic furniture promotes healthy development in children, growing with the child rather than the child outgrowing the furniture. Our products are successfully marketed worldwide in over 30 countries, and we currently deliver to more than 60 countries, including Australia from 2018 onwards. The German state of Baden-Württemberg has always been known as the home of inventors – the products developed here are an expression of their time. For more than 40 years, moll has manufactured office furniture, rotating shelves and children’s study desks and chairs with perfect craftsmanship. We are the inventor of the height-adjustable desk that grows with the child. Our working world is no longer imaginable without desks. Although ergonomics and the organization of work became a focus early on, people had barely thought about a children’s study desk. In 1974, moll unveiled the Perfect, the first desk for children and teens that was height-adjustable and grew with them. After countless product innovations, and 40 years, today’s top-of-the-line model, the Champion, has arrived. Made in Germany – at moll, this is not an advertising slogan, but a reality. All moll products are developed and produced in house, where everything started almost 100 years ago: in the Swabian Alps of southern Germany. Started by Andreas Moll as a family business in 1925, moll is now run by Martin Moll of the third generation. moll employs the best technicians, engineers and developers to produce high-quality study chairs, study desks and children’s furniture. Our focus on quality, sustainability and safety guarantees that we will remain a reliable partner for a wide range of functional furniture into the future. Thanks to their longstanding reputation, our products carry the “Made in Germany” seal. It not only provides a great trust advantage among our international customers, but also stands for technical and design innovation. Today we are proud that – together with our employees, suppliers and customers – we have become a leading provider of children’s desk furniture while still remaining a family-run business. In everything we do, we ensure that the moll brand stands for functionality and ergonomics with special high-quality design. Our goal is to offer design-minded customers innovative, high-quality, technically sophisticated functional furniture. It is appealing to the smallest detail, intuitive to use, and reliable. Our development is marked by milestones such as the first rotatable file cabinet (1960), and the world’s first height-adjustable desk for children and teens (1974). The latest examples of trailblazing innovation are the moll S9 three-dimensional movable swivel chair and the electric-motor-driven and height-adjustable moll T7 desk for the private office. We believe in the positive effects of good design. Our designers develop furniture to the highest standards in cooperation with renowned designers. For us, design is an important success factor for our products. That doesn’t just mean we make pretty products. We consider design to be the sum total of the demands the user makes on us, the details made possible by technical innovation, the production conditions and of course the ecological requirements as well. Our products’ durability is important to our design. This affects not only the product quality, but also the design quality. Nothing can be more sustainable than a product that accompanies a person throughout life and is even passed down to others. That it is also user-friendly, long-lasting, innovative and environmentally sound is a given. Technical and health safety are indispensable in children’s furniture. That is why we subject ourselves to high standards and have our products continuously inspected and tested for technical and health safety by leading independent institutes. The independent TÜV Rheinland institute checks our products for technical safety. This ensures safe functionality in our products. The GS symbol was introduced in Germany in 1977 and is Europe’s leading safety seal. It ensures consumer protection and determines that consumer products meet all legal safety requirements demanded by the German product safety act. Independent experts inspect many product features, including ergonomics and chemical analysis of polymer materials affecting the products tested. The law calls for regular testing of certified products. This guarantees continuous inspection of the products and production. The GS symbol requires very high standards that exceed the basic requirements for the CE symbol. The GS symbol guarantees that our products are technically and mechanically impeccable. For us, quality is in the whole and in the details. All our products are made with select materials according to the highest quality standards. Appealing design and premium German production make our products especially long-lasting. But not only our production quality meets high standards. Just as important is customer satisfaction – the quality of our service. At moll, we demand the highest quality of workmanship and service. All customers who have purchased moll products from a commercial furniture dealer immediately receive an extended 5-year warranty on the performance, quality and functionality of the materials and components used. Tastes vary and can change over time. That is why moll furniture is flexible and can adjust anytime to current trends or evolving preferences. This makes moll furniture timelessly practical. Moreover, moll kids products, such as kids study desks and kids desk chairs, can be extended anytime. They can be upgraded with more work space or storage. The desk isn’t just an element for working and learning. Its size makes it a central visual component in the work area or children’s room. The modern design of moll furniture is enhanced by a variety of different color variants. Whether in the moll kids or the moll unique line, there is no limit to the design flexibility, so anyone can find exactly the color combination he or she likes or that best fits the furnishings. In addition to the desks’ décor variants, a total of 18 different fabrics are available for the four chair models. moll’s intention is to prevent as much as possible any negative environmental effects that are caused by its business activities. The applicable environmental laws and regulations are followed in their entirety. moll products are an interplay of ecology, economics and ergonomics. We don’t want to reduce the utility of our products due to our conduct in production. We are convinced that a product can only really be good if it comes about in a good way. Quality and design are the guarantors of our sustainability. Only the best materials and the greatest care in production ensure the lasting quality of our furniture. The concept is designed for lifelong use and true sustainability. Made in Germany, the furniture uses premium materials that ensure durability. Thanks to its timeless design, variable dimensions and interchangeable elements, the furniture outlasts the user’s changing preferences, while its functional components always keep it ergonomic. We also manufacture exclusively in Germany. This ensures quality, jobs and adherence to social and ecological standards. For more information and to see our product range, please visit our Australian online store.